I was watching an episode of Castle recently (in itself not surprising since it's the only show on right now where I watch weekly [Psych being the other]) and I made a startling realization. Nathan Fillion is playing the same character he played in Firefly. I will not explain to you what Firefly is. You should know this by now. Now you may think, "How can you claim Richard Castle is the same character as Malcolm Reynolds?!?!?!" And I say to you this: Watch the pilot, Serenity, and then have the independents win the war. Who is Malcolm Reynolds if he didn't suffer the horrors of defeat and the aftermath of Serenity Valley? 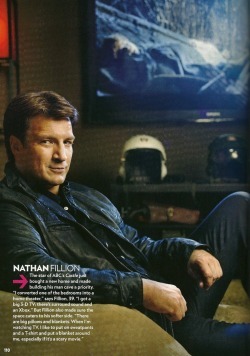 In "Nathan Fillion", "character", "television"